Customer experience (CX) is all about how your customers perceive the interactions they have with your company. There are three main factors to customer experience: ease, effectiveness and emotion. How easy is it for customers to achieve their goals? How effective, efficient and comprehensive are you at meeting their needs? And how does the customer feel about your company as a result? All the analysts I’ve spoken to from Forrester, Gartner, InfoTrends, Celent, Novarica, Madison Advisors, Frost & Sullivan, etc. 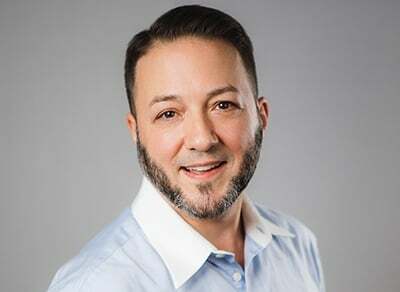 tell me that most companies are not able to connect their annual list of projects and initiatives to improving customer experience, and fewer still can correlate CX improvements to meaningful operational savings, revenue retention or revenue growth. Forrester’s done the most work here of any other firm. They’ve been at it the longest, too. They developed the Customer Experience Index (CXi) as a way to measure and quantify 25 different drivers of customer experience across 18 different industries. This, in a nutshell, is why senior leadership cares so much about customer experience. It comes down to revenue retention and growth. 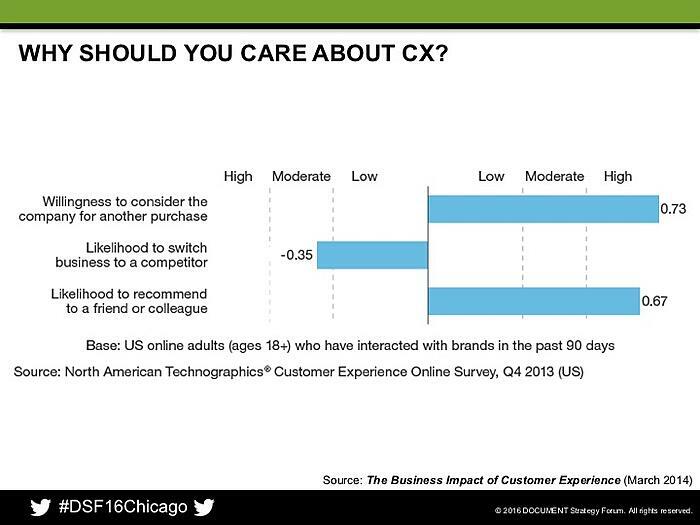 This chart shows that CX is highly correlated to the willingness of a customer to consider making another purchase. CX also affects how likely your customers are to switch to one of your competitors that offer a better customer experience. And it also is very highly correlated to how likely your customers are to say nice things about your company to their friends, family and colleagues – that’s called incremental revenue via word of mouth. The "likelihood to switch" number is negative. That means customers are less likely to leave a company that has good CX. Forrester noticed that number is about half the other two and did some digging. It turns out that industry dynamics play a big role. 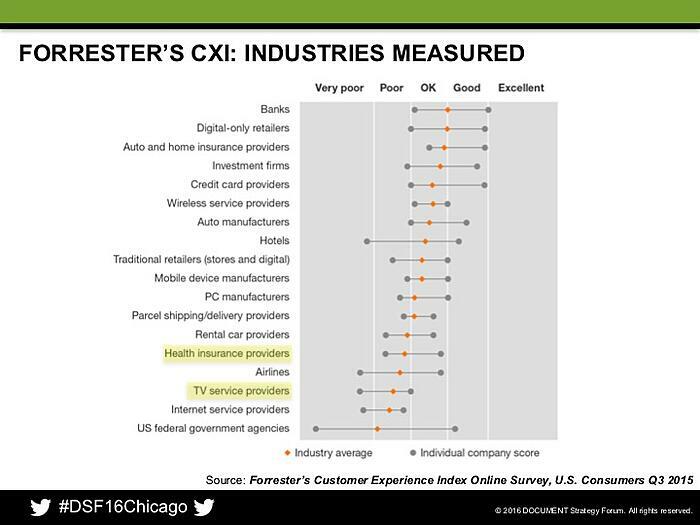 Look deeper into the numbers, and you see that some industries are far more sensitive to CX than others. Look at wireless service providers at the top versus the two categories of insurance providers at the bottom. That’s a huge difference. And it has nothing to do with the size of the industries. It has everything to do with the amount of choice and differentiation there is among the competitors, and how easy it is for a customer to switch companies for any reason. 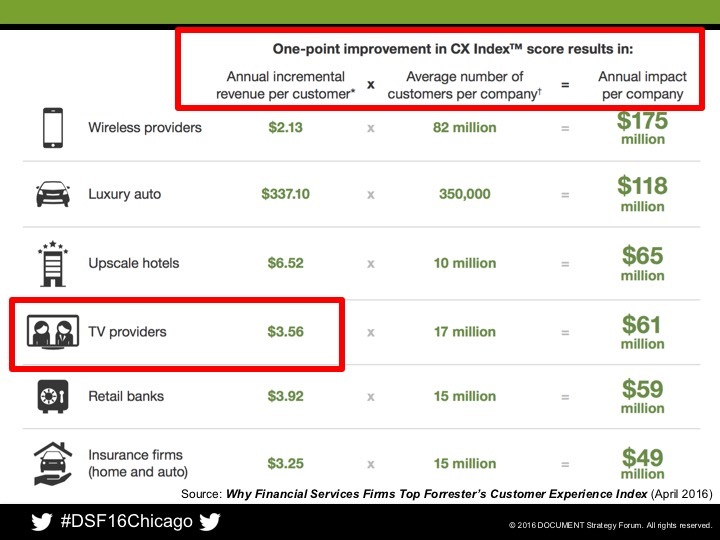 Forrester did a report in 2014 (that they’re about to refresh in a few weeks), in which they looked at companies that made dramatic year-over-year improvements to their CXi scores. They wanted to know what these companies did that made such a big difference. What most had in common were improvements to legacy systems, including written communications. And customer communications is one of the few “universal drivers” of customer experience. The quality of customer communications affects the customer experience for every industry. Let’s look at three examples from those poorly-performing industries: two health insurance companies (BCBS of Michigan and BCBS of Illinois) and a TV service provider (Cablevision). 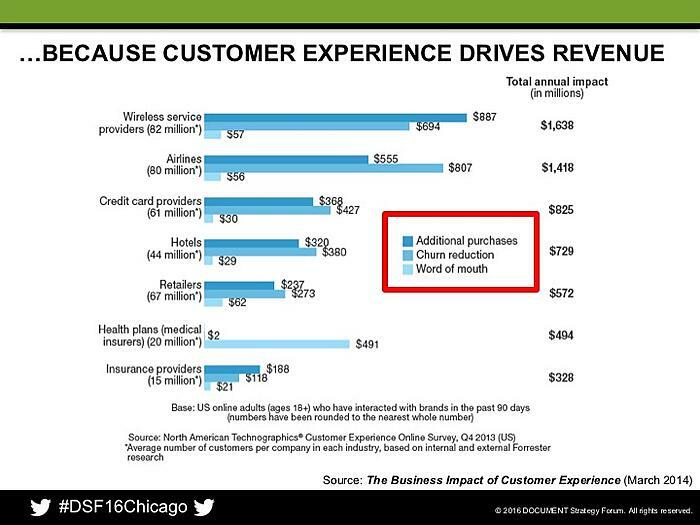 Now, back to customer experience driving revenue. I'm sure that you've seen the graphic from Watermark Consulting showing how the stock prices of Customer Experience Index score leaders outperformed the stock prices of all other companies, not just the laggards. It's a little hard to believe, I know. And it's hard to relate to. Well how about something more concrete? What if I told you that Forrester’s been able to determine that for TV service providers like Cablevision, every additional Customer Experience Index point is worth $3.56 of annual incremental revenue per customer? As of their last regulatory filing, covering the first quarter of this year, Cablevision currently has 3 million customers. That means with a little over 3 million subscribers, those additional 14 points should have been worth $11 million in incremental revenue. Well, according to their filing, that's about how much Cablevision's revenue grew year over year. But the story gets better. Prior to investing in customer experience, the company had lost subscribers and revenue for 11 straight quarters. That’s almost 3 years straight, folks. Just this past quarter, they reported the first year-over-year customer growth in years; the lowest quarterly customer churn rate in more than eight years; growth in the number of subscribers, net revenue, operating cash flow and operating income; and they now have the highest average monthly cable revenue per customer in the industry! Customer experience matters, and customer communications matter to customer experience. So what are the transferable lessons other organizations in other industries can take away from these companies’ dramatic CXi improvements? It’s all about people (organizational culture, reporting structure, etc. ), processes (customer journeys, workflow, etc.) and technology (customer communications management, digital experience management, etc. )...and you need to solve the problems in that order. There’s a lot you can do to improve CX before you even get to the technology. You may very well find that you’ll need to invest in next-generation customer communications and customer experience software, but don’t overlook the wins you can achieve in other ways as well, like improving readability or redesigning the customer self-service portal for easier navigation. Do you have questions about other ways to improve your CCM or need advice about creating a transition plan to move from legacy CCM and CX software to next-generation solutions? Drop us a line. We’re always happy to help.